For this month's interviewee, you may not really know her (yup, at last, an interviewee that is a female! 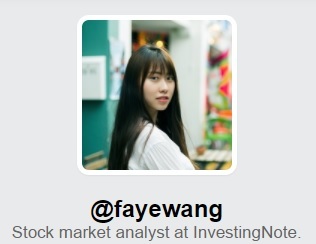 ), but she is actually a stock market analyst on InvestingNote. I first noticed her was when she posted her analysis of Sheng Shiong on InvestingNote. It was quite detailed and seems to have addressed some of the changes in Sheng Shiong over the last few years. Without further ado, let's get straight to the interview questions and her answers! 1. Tell us more about yourself and why did you join investingnote? Faye: My name is Faye Wang. I read economies in my undergraduate years, and found myself extremely interested in corporate finance and different investment instruments. Thus, I embarked on a Master’s degree in financial analysis and fund management at the University of Exeter, United Kingdom. Personally, I believe securities investment do not concern just stock prices, but also involves gauging a firm’s whole business, as well as the industry it is in. Based on that, I adhere to the principles of fundamental analysis and consider myself a value investor. I joined InvestingNote because I feel that IN is a very unique social network platform that allows me to synergize my passion for investing and what I learned in my post-graduate course. I was always interested in the Singapore stock market, which is quite mature and efficient, albeit with a relatively low trading volume. Searching online for resources to educate myself about the Singaporean market, I found IN, and felt that it is an efficient platform, not only for existing investors and traders to share ideas, but also to help prospective investors learn more about the market. I was also attracted by the very idea of a social network for stock trading and financial literacy that IN represented. By joining IN, I hope users can benefit from my analyses, for which I aim to maximize the utilization of my knowledge, toward their investment decisions. At the same time, I also hope to gain valuable insights and experiences from the wisdom of the users at IN. 2. How did you get into investing? Faye: When I was at University, I always heard sayings such as, ‘smart people do not put their money in the stock market’, or ‘retail investors are the one who bear the losses in exchange markets, while profit is being taken by the big institutional players’. As a student with an economics background, my interest in investing was driven by pure curiosity. However, I did not think my knowledge was enough for me to enter the market, and thus I acquired further education and sought work experience in the financial industry. During my postgraduate program, I started dabbling in the Chinese exchange market. My investment activities came to a halt, however, when I commenced my internship at the securities department of ICBC bank, to avoid potential conflicts of interest. It was not all sad news as, while there, I gained valuable insights regarding the Chinese stock market. At the same time, I found that those popular sayings above seemed to be false. Securities are one of the most popular investing instruments as they are well-regulated and liquid. For sure they carry some risk, but wise investors know how to diversify risk by using appropriate portfolios, when to take profit and exit, or when to cut their losses timely. 3. What is your investing style? Any idols? 1) Use the discounted cash flow or other models to calculate the ‘intrinsic value’ of a firm. However, there may be some problems in applying the models. One of them is to choose a growth rate since you it to discount the cash flow or dividend (when using a dividend growth model). Different people hold different views, and one can use revenue growth, historical EPS growth or ROE. Thus, results may be subjective and can really depend on the model or growth rate you apply. 2) Use comparable indicators like the P/E or PEG ratio to help you judge whether the stock is undervalued or overvalued. In lieu of ‘idol’, I would prefer to use the term ‘teachers’ to refer to the people who influence me in the realm of investing. No one is perfect, people make mistakes sometimes, and thus it is important to learn both from other people's successes, and their failures. There are two people who have deeply influenced me, namely Benjamin Graham and Korekawa Ginzo. Margin of Safety and Risk Control are two important things I have learned from the two masters. 4. What is your thought process when it comes to stock-picking? Faye: I have put some of my thoughts on the stock-picking process in one article at IN, available from this link. Inspiration for investment can be very random, like a piece of news about some company saying that it has increased revenue. A screen with preset criteria can also used for stock-picking, and scouring through the annual reports is necessary to get certain selected ratios and numbers. However, all of them just give me a inkling of how the company will perform, and an incentive to investigate further. My stock-picking process follows the top-down method, where I will choose an industry that I am familiar with or have interest in, such as the healthcare industry. Then, I will set a few key criteria in my mind before starting to screen, such as revenue growth >5%, return on equity (ROE) >15%, P/E ratio <20. I will also generally avoid stocks with excessive leverage (all the numbers mentioned are just examples, and you should have your own criteria). A stock does not have to exactly meet all the criteria, but a rough standard should be satisfied. After deriving the screened results, I will take a look at the company’s financial results and current stock price. Normally I will not buy immediately but will first observe for a period of time. 5. How many stocks do you think one should hold for diversification? Faye: I would not recommend too many stocks in one portfolio because normal investors will not have enough time to monitor so many of them. For me personally, it is less than 10. However, it really depends on one’s capital, risk appetite and the returns expected. I would also recommend investors put indexed ETFs into their portfolio as a form of diversification. Additionally, the portfolio should cover at least 3 industries or sectors, and it is also recommended to cover different types of stocks such as defensive, cyclical, dividend and growth stocks. 6. Any thoughts about the current market situation? Faye: The Singapore stock market is currently quite bullish; research seems to indicate that this started in the beginning of 2017. However, as many stocks reach their 52-week or all-time high, market corrections can be expected to be forthcoming. All investors and traders should consider their transactions with extra caution. 7. Able to reveal which stocks are currently on your watchlist? I am interested in the healthcare industry because of the increasing aging population and am optimistic about its future potential, but have not added any stocks in the watchlist as they seem to be relatively overbought lately. 8. Finally, any advice for newbie interested to get into investing/trading? 1) Know as much as possible about the company you are going to invest in. It is good to start from the financial statements, and you can refer to one of my previous articles on how to fundamentally analyse a stock at https://www.investingnote.com/posts/75620. You should also equip yourself with other information such as their business models, nature of the industry the business is in, recent news related to the firm et cetera. Next, you should always have an intuitive forecast or gut feel of future trends. 2) Do not blindly follow others, and always do your own critical thinking. You may always see ‘DYODD’ in other’s post and article, and that is not just for the sake of indemnity. It is true that when many people start to discuss a stock, it is already too late to board the ship. People are emotional, and thus can easily be influenced by others; bear that in mind. There is an entire field of study in behavioural finance called sentiment analysis devoted to studying how emotions can affect stock price movements. 3) Always keep learning about the market. Read financial blogs and understand the different asset classes, old or new. Pay attention to any recent policy changes and consider the consequences they may have on the stock market. Listen to other people’s opinions as another way of learning but remember to have your own judgement. Hope you like this interview series and please do remember to like our Facebook page (T.U.B Investing) and follow me or her on InvestingNote.